If investment is the goal, what should SA’s electricity game plan be? South Africa has correctly identified the lack of investment as a serious constraint to economic growth and job creation. President Cyril Ramaphosa has moved to address the problem by reaching out to domestic and foreign investors both informally and through the inaugural Investment Conference, which took place in Johannesburg in October 2018. Without question, affordable and reliable electricity is a prerequisite for many investors, particularly in areas such as mining and mineral processing, where South Africa has a relative advantage, owing to its natural resources, as well as its well-developed capabilities in extracting, processing and exporting the mineral products. Likewise, the country’s reindustrialisation aspirations, as well as its plans to expand the agricultural and agroprocessing sectors, could well turn not only on security of electricity supply, but also on the pricing of that energy. 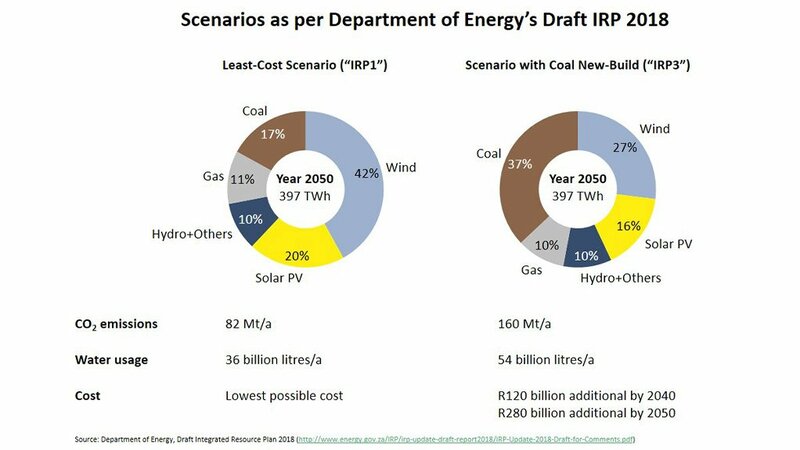 South Africa is in the fortunate position of having a well-defined instrument, in the form of the Integrated Resource Plan (IRP), for determining the scenarios for meeting electricity demand, as well as the cost of each scenario. 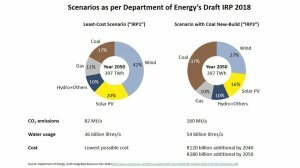 Crafting an IRP begins with a technoeconomic exercise to determine the least-cost electricity mix into the future, based on best available information at the time. If deemed prudent, that least-cost base case can then be adjusted in consultation with stakeholders to incorporate certain policy objectives that a mathematical model is unable to reflect. In the not too distance past, the IRP was politically distorted even at the preliminary technoeconomic stage. Fortunately, such distortions have started to make way for an IRP that is less politically compromised and far more aligned with best planning principles. The technoeconomic optimisation first discovers the minimum cost for electricity provision without constraints. Policy adjustments are then applied to that base case, and all deviations from it are costed, such that policymakers and the public can make informed value-for-money decisions. If attracting investment is truly to be the defining goal of the Ramaphosa administration, however, South Africans of all persua- sions should not only be supporting, but also demanding, the adoption of a least-cost IRP, with as few policy adjustments as possible. This is because the steep fall in solar photovoltaic (PV) and onshore wind costs over the past five years has placed South Africa in the enviable position of being able to meet all its policy objectives – energy, economic, employment and environmental – without having to make a detour off the least-cost highway. The trade-off between cheap and clean, and between cheap and job-rich, no longer pertains in countries such as South Africa, with world-class solar and wind resources. Evidence as to the potency of South Africa’s wind and solar resources was provided in a joint analysis conducted in 2016 by the Council for Scientific and Industrial Research, Eskom, the South African National Energy Development Institute, Fraunhofer IEE, of Germany, and the Danish Technical University. It showed that, on average, South Africa has almost two times more solar energy hitting each square metre per year than Middle and Northern European countries. As a result the electricity generated from solar PV in South Africa is roughly 50% cheaper. Likewise, the country’s wind resource is significantly better, and more widely spread, than initially assumed. An analysis of five years of historical wind data from satellite observa- tions concluded that a 35% capacity factor or higher could be achieved on almost 70% of all suitable land in South Africa. The same study also indicated that, using less than 1% of its land area, South Africa would be able to generate more electricity from wind and solar today than it currently needs and also meet all future demand. Ensuring this triumvirate of sun, wind and land delivers electricity as reliably as systems built on coal and nuclear, the so-called variable renewable-energy generators solar PV and wind will need to be supported by flexible power- generation technologies that can kick in whenever there is no wind and no sun. Technically, these flexible solutions already exist in the form of pumped hydro, hydro, gas-fired power stations, biogas-fired gas engines, demand response (including the flexibility in the charging pattern of a fleet of battery-electric vehicles) and, increasingly, in the form of stationary battery storage. In addition, the country’s existing coal fleet can, during its decade- long ramp-down, cost-effectively back up variable generators. The good news for South Africa is that this combination of a lot of cheap, yet variable, electricity from wind and solar, blended with small amounts of more expensive but flexible electricity, is 20% to 30% cheaper than the conventional alternatives of new coal or new nuclear. What’s more, because South Africa has better combined solar, wind and land resources than most other countries, its power will be comparatively cheaper, forever. The upshot is that South Africa can, once again, reposition itself as the investment destination of choice for any activity that is electricity intensive.